Delivering Aid to Terrorists a "City Purpose" in New York? New York City Council member Charles Barron, who also serves as the Chair of the Higher Education Committee, helped lead a convoy with 200 activists to Gaza this summer for a group that openly advocates for the terrorist organization Hamas. Barron (D-Brooklyn) sought advice from the city's Conflict of Interest Board (COIB) prior to his trip: Is it permissible for the group to pay for his travel expenses? A COIB attorney said it "appears that the trip will serve a City purpose," based on the representation Barron offered – that the visit to Gaza would involve delivering relief and medical supplies and meeting "with leaders of charitable organizations, schoolteachers, students, heads of refugee camps, patients and nurses." New York is America's ultimate melting pot, with sizeable constituencies from all over the world. When a New York City official visits Ireland or Italy, it historically has been viewed as spreading goodwill for New York and thus, serving the city. But it's doubtful those trips involved meetings with leaders of terrorist organizations. Charles Barron's trip to Gaza, along with two of his staff members, was paid by Viva Palestina, a group launched by British Member of Parliament George Galloway who has twice led convoys to Gaza that culminated in meetings with, and delivery of more than $2 million in the form of cash and supplies directly to Hamas officials. The cost of each person's travel was estimated at $2,400. The United States has designated Hamas a Foreign Terrorist Organization (FTO) and outlawed providing support to it. Last November, a federal jury in Dallas convicted five former officials of the Holy Land Foundation for Relief and Development of violating that and other laws like it. Barron came to lead the convoy, which left the United States in July, after Galloway passed him the baton upon reaching Gaza, as noted in an account provided by convoy participant Hector Carreon. According to Carreon's report, Galloway called Barron "one of the most important new and rising voices in the Democratic Party of Barack Obama, the City Councilman of New York City to whom I now hand over formally the leadership the American Viva Palestina convoy, Councilman Charles Barron." Upon their arrival in Gaza, both Galloway and Barron knelt down in a Muslim prayer position. Barron did not respond to calls seeking comment. The Investigative Project on Terrorism has been unable to obtain the letter Barron sent to the COIB detailing what he expected to happen on the trip. However, the response obtained from a COIB attorney includes a summary of Barron's representations – making no mention of meetings with Hamas officials. A COIB attorney said board staffers are not allowed to comment on their communication with city officials. "These views are conditioned on the correctness and completeness of the facts supplied to us. If such facts are in any respect incorrect or incomplete, the advice we have given to you may not apply." Barron, a former Black Panther, spoke at a Viva Palestina rally at a Brooklyn church on July 3, 2009, a day before the Viva Palestina convoy left for the Middle East. There, he declared: "I am not a politician. I am an elected revolutionary" and acknowledged members of the new Black Panther Party in attendance. In his remarks, Barron criticized the White House for not speaking up when Israel intercepted a boat carrying former Congresswoman Cynthia McKinney for entering restricted waters off the coast of Gaza. "And how dare you, Barack Obama, how dare you go to Africa, kill three Somalians for trying to protect their water when an American boat went into Somalian waters….You go and kill three Africans to save an American ship and you're silent on the Israeli government taking a ship [Applause over few words] humanitarian aid [Loud applause over several words] the people of Gaza. So I'm glad I'm going on the trip and I'm mad. Anybody want to go with me? [Several words], because I'm not going over there to play no games. We have no fear in our hearts [Applause over few words]. Ain't no Kool-Aid coming into our veins….Let's continue the struggle. But you know what? Inevitably we will win." "But in choosing Hamas, what they chose was one united Palestinian state on all of the 1948 territories from the north to the very south. That is what Palestinians chose. And in supporting Palestinian choice we are saying we support their right to liberation from violent colonialism." "It's not about charity... but in every way that we cut it, it is political. The existence of survival of a single Palestinian is a political act of victory. What this convoy seeks to do is to preserve, not seeks, but what it does effectively, is it preserves our most basic political rights, political rights that prevent and preclude the damages caused by imperialism, the damages cause by Zionism, the exploitation and abuse of people." "Is it Hamas that's denying children IVs and medical supplies while they lie in hospitals dying? Is it Hamas that put these children in the hospitals in the first place? No. Is it Hamas that destroyed half of the hospitals in Gaza, killing 1,400 people and 600 children? You could ask yourself these questions. Or it's not who did what to whom. You could see right now if Israel were to stop its aggression, it would stop the bloodshed, the violence, the crisis [sounds like 'indeed'] would stop immediately, no matter what you say Hamas did." Barron heard all of this, but did not reflect the political nature of the undertaking when he advised New York City ethics attorneys about his pending trip. According to the City's letter in response to Barron's request, he had indicated he planned to be out of the city from July 9th through the 17th, along with his Chief of Staff Nayo Joy Simmons, while staffer Lamont Carolina was leaving with the convoy on July 4th. It isn't clear whether the aides used vacation time or were paid as if on duty, given the unofficial opinion that their trip could serve a city purpose. "Zionism and imperialism and capitalism is [sic] able to institute in our movement and that retards our growth." "So I wanted to make a statement that we're going to break the siege. Barack Obama said the siege of the Palestine is intolerable, then he shouldn't tolerate it. And that's why we went forward to say to the people of Gaza, we want our American dollars to go to the babies of Gaza, not the bombs of Israel." "M-1, I know him personally, I've known him for years, he spends his entire life focusing on this. So have I. When you are focusing on Gaza, you are focusing on the hood. Because it's the same struggle, same enemies, same fight. So any blow against imperialism, any blow against racism and capitalism, is a positive blow for all of us." Despite Barron's role in providing material and moral support to a U.S. designated terrorist organization, Barron drew five challengers in the recent Democratic primary in his attempt to be elected for his fifth term, but easily cast them aside, winning 58 percent of the vote. 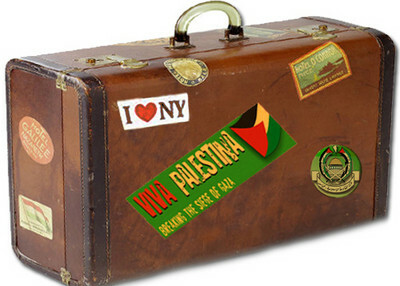 To read more about the Viva Palestina USA effort, see the IPT's report here. I e-mailed this article to Beck and Hannity at FoxNews hoping they would cover it on air before I received it from IPT..........thankful you are alerting your readers of this event. Thank you.